i don't know what the hell i am doing in this picture. it looks like i am trying to strangle myself or i am doing yoga, DOWNWARD DOG STYLES! I'm starting a new music magazine out of Sydney, Australia. It's an interview based magazine available for free quarterly. I'm going to try and stock it a few places internationally but it'll mostly be circulated throughout Australia. For the 1st Issue I've lined up Eddy Current Suppression Ring, Naked On The Vague, Fabulous Diamonds, Beaches, Songs and Woods. What I'm writing to you about though has more to do with the website. I want to have a monthly podcast with live sets by some of my favourite bands. I was wondering if it'd be cool to record you guys when you play with Jay Reatard in Sydney. I've spoken to Matt from Naked On The Vague, as he records a lot of live music, mostly just for himself but he's starting to release some stuff on his cassette label, Near Tapes, and he's willing to record the set. 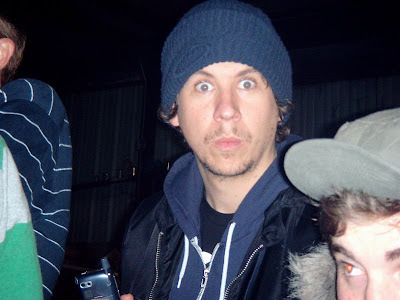 If I could have a recording of that night, with you, Jay and NOTV to launch the website, I'd be so stoked. Can't wait to see you guys play. I just wanted to show you some pictures I took at your awesome show in Lisbon at zdb. Hope you like them, and I hope to see you play in Lisbon again soon, it was a really great concert. Dean! 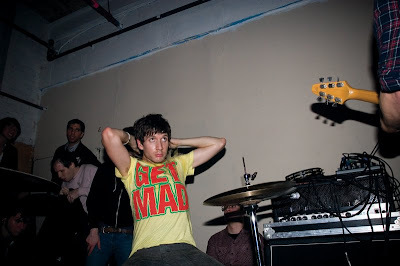 You must make that "Get Mad" Shirt into a No Age "Get Hurt" T-shirt!